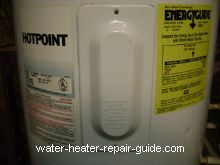 Want to learn how to repair your water heater? Many problems are easy fixes. Some are more complicated. You should only attempt repairs if you feel confident to do so safely. and electric storage water heaters. (go figure), you should find the information you need here. Check your electrical breaker. It may have tripped off. in between the on and off position. Push it to off position and back to on. appear to be in the on position. has tripped. Shut it off and back on to reset it. be to check the reset button. The first thing to check would be the pilot light. 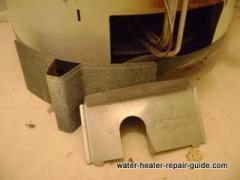 tank or go to this pilot light page for help. Environmental Protection Agency recommended temperature settings. hot, not enough hot, water cold. reset it, or replace it. clothes washer, hot water pressure low in whole house. How to test or replace an element. Different types of elements. Different problems associated with a gas valve. Many times the gas valve is not the problem after all. 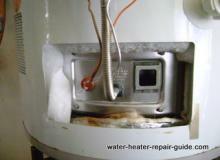 A water heater leak is not always easy to find. Especially if its a small leak. 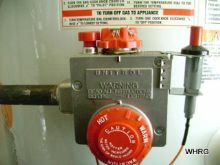 Most water heater leaks are caused by plumbing connections, parts, or valves leaking. work, common problems, how to replace. There can be all kinds of strange noises coming from your tank. singing, screaming, cracking, popping, tapping. These units came on the market in 2005. These pilot lights had to be lit manually with a flame. Less sediment means longer tank life. of the tank. Tank insulation was doubled in new units as of 2016.
up to six gallons are ideal to place under sinks. are also sold with single or duel heating elements.